In this article, I will explain the best TV streaming devices available in the India market. Read this article to know the details, features and best online price in India for TV streaming devices. Read this article and know the cheapest TV streaming devices. TV streaming devices are popular in modern life. Most of the people are busy in their life. So it is difficult to watch a program at a particular time. You can watch TV programs through your computer, tablet or smartphone at any place using streaming. Lots of TV streaming devices are available in the market. Now I am sharing best TV streaming devices with social network support. Netgear NeoTV Streaming Player NTV300 is one of the best TV streaming devices available in the market. Netgear is also one of the best Wi-Fi router manufacturing companies. Using this device, you can stream hundreds of HD TV channels. Mainly we need a computer to stream TV channels. Some of the main limitations of computers are small screen size compared to televisions. Also, you can watch thousands of movies, songs and also YouTube videos through this device. It also supports Wi-Fi, for streaming HD videos through your television set. High speed Wi-Fi supports fast and better streaming performance than other devices. NeoTV also provides an application for both Android and iOS. Using this application, you can navigate channels through your smartphones. Also, you can play favorite videos and share these channels to Facebook. In this device, VUDU provides online movies, YouTube provides online video sharing, Pandora provides online music, Hulu plus provides online TV shows and also you can play favorite games on your TV. This TV streaming device provides one year manufacturing warranty. Speed of Netgear NeoTV Streaming Player NTV300 is up to 150 Mbps. Must need a broadband connection to stream videos in your TV. The price of Netgear NeoTV Streaming Player NTV300 is predicted to be $49.99 which is almost equal to the price of Rs.2737 in India. Also you can purchase this device at lowest online price in Amazon, i.e. you can purchase Netgear NeoTV Streaming Player NTV300 at the price of $39.99 which is equal to the price of Rs.2189 in India. 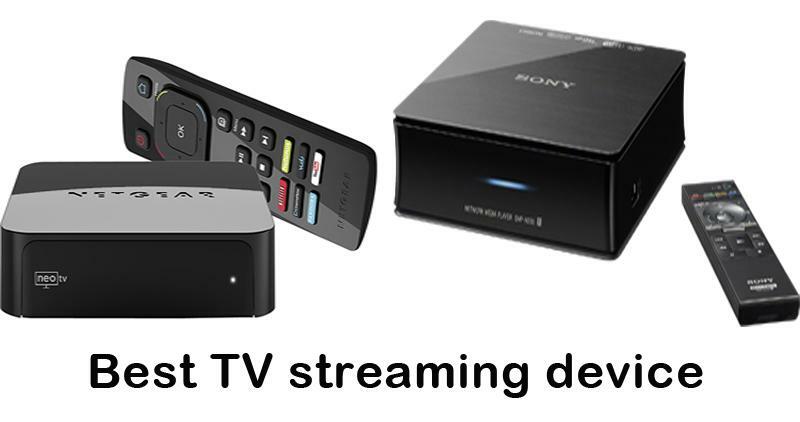 Sony SMP-N200 Streaming Media Player with Wi-Fi is another best TV streaming device available in the market. Sony is one of the best TV and smartphone manufacturing company in the world. Using this device, you can stream thousands of hit movies, online videos, online songs, TV shows etc… through your TV. Now you can convert your TV into smart TV at lowest price. It also has a USB port which is used for playing and watching movies, videos, songs and images through your TV. It also provides a simple remote application to control your TV. You can control your TV by your Android or iOS devices. You can post a message to Facebook or Tweet a message to Twitter by using Sony SMP-N200 Streaming Media Player with Wi-Fi. Now you can convert your TV as a social media. It provides better HD quality for watching videos. This device can also stream 3D videos which is a best option for users. It provides one year limited warranty on parts and 90 days limited warranty. The price of Sony SMP-N200 Streaming Media Player with Wi-Fi is predicted to be $99.99 which is almost equal to the price of Rs.5474 in India. You can purchase this device at 50% off in Sony's official store. That means you can purchase this device at $49.99 which is almost equal to the price of Rs.2737 in India.